Will there ever be an end to potato salad recipes? No. No there won't. Because everything is good on potatoes. 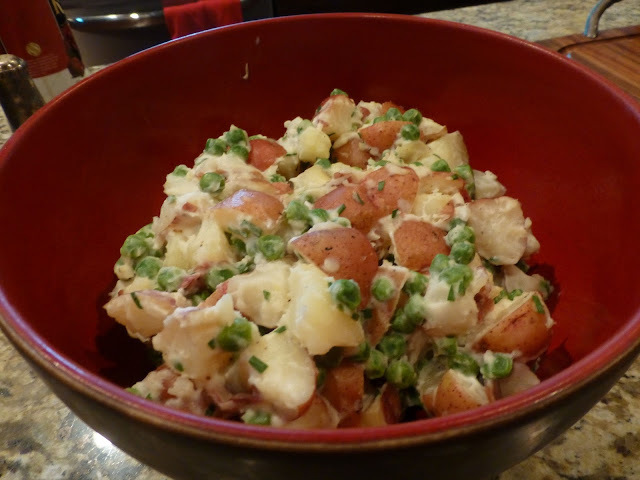 There is nothing mind blowing about this recipe other than lots of peas. I guess I'm not sure peas really blow anyone's mind, but I really liked them in there. If I had it, I would have added bacon too. Boil the potatoes until tender. For the last minute, add the peas. Drain, add S&P. Mix the mayo, sour cream, vinegar, sugar, and chives in a separate bowl. Add to the potato/pea mixture. Refrigerate until ready to serve.